For 90 years, LANXESS has produced iron oxide and chrome oxide pigments for numerous applications from what is reportedly the world’s largest production plant for inorganic color pigments, in Krefeld-Uerdingen, Germany. “What began very modestly 90 years ago has turned into a genuine success story,” the company said in an anniversary announcement. Specialty chemicals group LANXESS AG is celebrating 90 years in the pigments business. 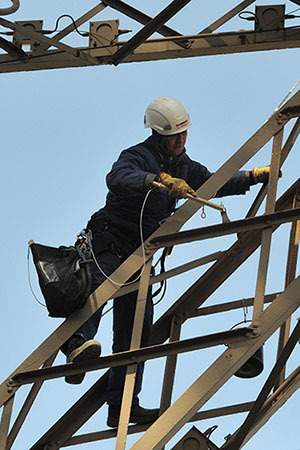 Its Bayferrox pigments provide the color for the Eiffel Tower's trademark high-grade anticorrosion coating. “Whether in the paint on the Eiffel Tower in Paris, the red asphalt in front of Buckingham Palace in London or numerous products we encounter in our day-to-day lives—pigments from LANXESS are in use all around the world,” the company announced. Since its launch in 1926, more than 13 million metric tons of pigments are said to have left the plant in Krefeld-Uerdingen. In the 1920s, Julius Laux, head of the aniline plant in Uerdingen, started searching for ways of using the iron oxide pastes that were a waste product of aniline manufacturing, the company explains. In 1925, he discovered that the presence of salt solutions led to the formation of intensely colored oxides that were ideal for use as pigments. Just one and a half years after this discovery, production began. After manufacturing 1,200 metric tons of iron oxides in 1926, production quickly grew to more than 5,000 metric tons in 1927. 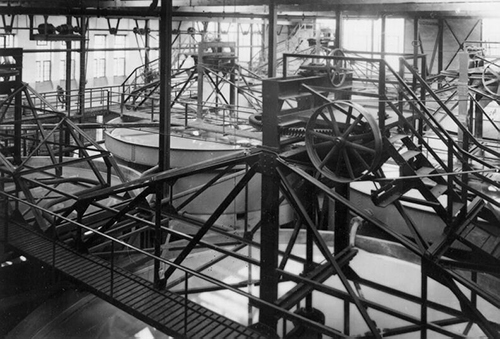 Thickener in Uerdingen site’s iron oxide plant 1 in 1929—three years after production launch. Just a short time later, synthetic iron oxides had established a firm place on the market and were being used primarily to color linoleum, surface coatings and construction materials, the company notes. In the 1960s, annual production volumes climbed to more than 100,000 metric tons. The range has also grown considerably over the decades. While customers could choose from 25 colors in 1931, the current range extends to more than 100, it says. In 1976, the iron oxides from Uerdingen got their own special name and, since then, Bayferrox has been the most important global umbrella brand for the pigments, according to LANXESS. The products are distinguished by their high quality and simple and environmentally compatible processing, it adds. The company says a key product development came in the 1990s with the introduction of microgranules, which support low-dust handling and are free flowing for metering purposes. The latest groundbreaking innovation, according to the manufacturer, is the new plant in Ningbo, China. The LANXESS Inorganic Pigments business unit (IPG)—including staff at the Krefeld site—reportedly developed a completely new technology, known as the “Ningbo Process,” for the plant, which has since become another global benchmark for sustainable iron oxide production, it adds. To mark the occasion, the manufacturer announced a new initiative for young people in Krefeld at a celebration observing the 90th anniversary of the Uerdingen production facility for iron oxide pigments. 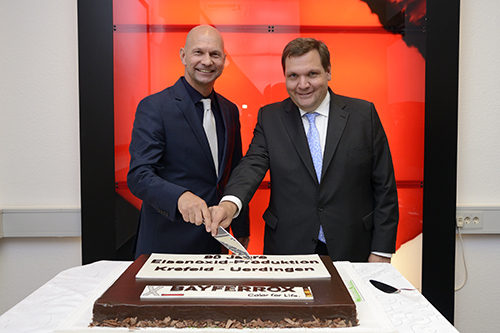 Frank Meyer, Mayor of the city of Krefeld (right), got to cut the birthday cake with Jörg Hellwig, head of the Inorganic Pigments business unit (left), at an event commemorating the company's 90th anniversary, where they also announced the launch of a new “Better Learning” initiative. “We want to find a special way of thanking the city for the decades of outstanding cooperation we have had,” Jörg Hellwig, head of IPG, said at the event. Joined by Krefeld’s Lord Mayor Frank Meyer, Hellwig announced the launch of the new “Besser Lernen” (Learn Better) initiative for educational institutions and youth organizations in the city. With the Lord Mayor as its patron and a total fund of €50,000 (nearly $56,000), the initiative will support projects run by educational institutions and youth organizations that use color schemes and other measures to improve the learning environment or care services for young people. Public educational institutions, clubs and initiatives are able to apply for funding for projects being run in Krefeld that involve total costs up to €10,000 (about $11,000). “We are very happy that a global company like LANXESS has such an important base in our city and that those in charge are so committed to maintaining the close historic links between the company and Krefeld,” said Lord Mayor Meyer. LANXESS is a specialty chemicals company with a focus on the development, manufacturing and marketing of chemical intermediates, specialty chemicals and plastics. It reported sales of €7.9 billion ($8.83 billion) in 2015 and employs about 16,700 staff in 29 countries. It is currently represented at 55 production sites worldwide. 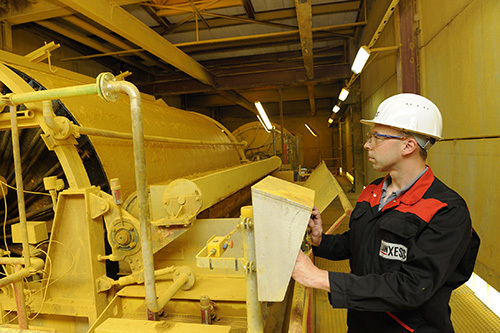 Production of yellow iron oxide pigments at the LANXESS site in Krefeld-Uerdingen, Germany. The IPG business unit is part of the company'’s Performance Chemicals segment, which recorded sales of €2.1 billion ($2.35 billion) in fiscal 2015. IPG reportedly supplies some 5,000 users worldwide with pigments that are used to color a wide variety of products. In addition to its site in Krefeld-Uerdingen, IPG has facilities in Porto Feliz, Brazil; Burgettstown, PA, U.S.; Branston, U.K.; Vilassar de Mar, Spain; Sydney, Australia; and Shanghai and Ningbo, China. IPG’s global workforce reaches approximately 2,000 employees, around 800 of whom work in Krefeld-Uerdingen. At the Krefeld-Uerdingen site alone, LANXESS produces more than 280,000 metric tons of color pigments a year, with the global figure at 375,000 metric tons—and growing.